In state after state, stunned drivers are pulling into gas stations advertising $4-per-gallon gas. Five states already have record-high gas prices, and another 22 states are within 15 cents of record prices. Economists say that prices may dip to around $3.25 later this year, but that everyone should start getting used to seeing a new digit on gas station price boards. The U.S. Department of Energy reported late Monday that gasoline prices at the pump averaged $3.96 a gallon nationwide, up a little over 8 cents from a week ago. "Nationally, gasoline prices have been above $4 for the last week or so," Jamie Webster, a senior manager with PFC Energy, told ABC News. "I would anticipate that staying above $4 a gallon for gasoline, the national average, is probably going to be the case through Memorial Day, and probably a few weeks after that." The main reasons for the high prices are a rise in demand as the U.S. and global economies continue to recover from the 2008 financial crisis, combined with the recent unrest in oil producing countries such as Libya. Combining the two creates pressure on prices from both sides -- lower supply and higher demand. Indiana is one state that has seen a new all-time high for gas prices -- $4.19 a gallon. "These prices are crazy. I'm putting $20 in here, and by the time I get home it will be gone," Cindy Potter of Indianapolis told ABC affiliate WRTV as she tanked up. Because of the high prices, drivers are trying to push the "E" on their gas gauges to the limit. In Mt. Pleasant, South Carolina, mechanics say they have seen a jump in customers who have damaged their fuel pumps by driving with empty tanks. "[I have] two small children to feed. So sometimes you just can't put $80 worth of gas in at a time. So, I usually do half and ride on that as long as I can," said Robert Huger of Charleston, S.C., in an interview with ABC affiliate WCIV. 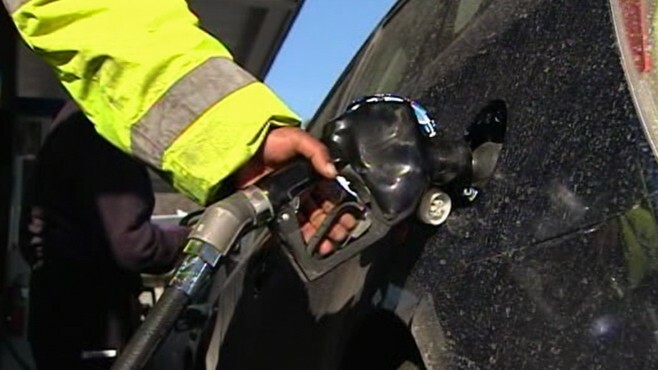 High gas prices have spurred an increase in gas siphoning theft. In California, Mark Moss, the owner of Canyon Ridge Contractors, told ABC affiliate KABC, "It seems like since fuel has spiked we've had several jobs where someone comes in and steals 1,800 - 2,000 gallons of fuel [from our trucks] at one time." There are no predictions for gas prices to go down significantly any time soon. Webster said a drop in prices back to the $3 or so we saw last summer could actually be a bad sign because it would probably come from a large economic slowdown. +Libya Turmoil = Higher Gas Prices? +Will Oil Break $100 per Barrel This Year?